What Extra Features Could Your Deck Benefit From? Welcome in the season of all things pumpkin, and plan to continue making the most of your deck because the fall season is the perfect time to get outside and enjoy the beauty of nature from your perfect deck. Summer may be drawing to a close, but that doesn’t mean your quality time spent with your deck has to end. Welcome in the season of all things pumpkin, and plan to continue making the most of your deck because the fall season is the perfect time to get outside and enjoy the beauty of nature from your perfect deck. What’s that, it’s not perfect yet? 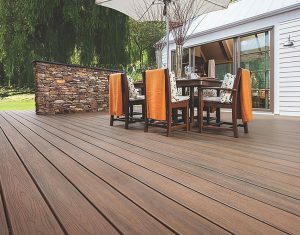 Here are three great features your deck needs to go from nice to outstanding. You don’t need a huge remodel to reap the benefits of an outdoor kitchen. Adding a grill to your deck is a great way to move cooking activities out of the kitchen and make them more social. If you’ve got some budget to commit to these updates, consider a covered area to house your grill so that no matter the season, the weather won’t keep you away from the grill. Whether you’re hosting big fall parties or small family dinners, consider making use of the outdoor grill so that you can spend time with the people you care about while still getting the cooking done. The delicious aroma of grilled food doesn’t need to be relegated to being just a summer joy. Grilled turkey, anyone? What’s a great event without great music? And no, this doesn’t mean you have to hire a DJ for your Halloween party. But it could mean investing in an outdoor sound system for your deck. Unless you enjoy setting up speakers in your open windows? If you’re hosting a party, it will be a great way to set the tone for the gathering without having to haul out a lot of bulky equipment. And if it’s just a regular family dinner, you could still use the system to introduce the kids to those great classic songs you love. There are many different options for you to choose from, so you are sure to find something that fits your needs. Adding some outdoor lighting to your deck is a fabulous way to make it more functional or to simply make it look nice. Adding functional lighting that illuminates the whole deck is super important this time of year because it is a great way to make the deck usable far into the fall, when days end earlier. If your goal is more aesthetic, consider light strands overhead or tiki torches on the railings to set the mood. There are lighting options to fit your every need and desire. This entry was posted on Friday, September 21st, 2018 at 3:52 pm. Both comments and pings are currently closed.